Unum is proud to partner with Maggie's - a charity that offers free emotional, practical and social support to people with cancer and their families and friends. Why Unum is partnering with Maggie's and more about the joint work we're doing. How employers can provide the right spport for their employees. A toolkit for employees who may want to return to work after cancer. As many as 63,000 people living with cancer today want to work, but are encountering barriers that prevent them because the right support isn’t in place for them or their employers1. 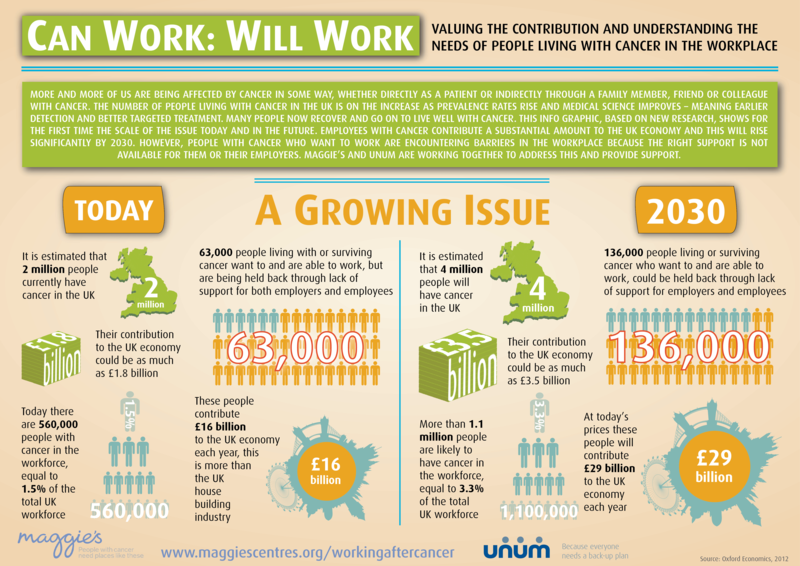 If the right support was in place, by 2030, an additional 136,000 people with cancer who want to work could. This would contribute an additional £3.5bn to the UK economy. That’s why we’re pleased to be partnering with Maggie’s - a charity that offers free emotional, practical and social support to people with cancer and their families and friends – to help put this support in place. The partnership has commissioned research, through Oxford Economics, to better understand the subject. During our partnership, we'll be running educational events and creating resources to help employers and employees address the challenges they both face as a result of cancer in the workplace. Oxford Economics explore the barriers, for both employees and employers, that are stopping people with cancer who want to work from doing so. Take a look at the tools and resources that Maggie’s can offer to people with cancer. A recent poll, commissioned by Maggie’s Centres and Unum, found that many employers aren’t providing the right support for staff with cancer – either during or after treatment. Often this is because employers are worried they may do or say the wrong thing and, as a result, don’t communicate effectively with employees about their needs and circumstances. To help in this situation, our employer toolkit includes video answers to some frequently asked questions. We’ve also included downloads on addressing concerns before, during and after a return to work, and providing guidance on putting together a graduated return to work plan. Content from the Cancer in the Workplace webinar we ran in February 2014, including a record of questions answered during and after the session. Information to help answer the various questions you may have around your employee’s illness and how a return to work might be managed. If your employee has expressed a wish to return to work, here’s step by step guidance to creating a tailored plan. For those who are able and wish to go back to work following cancer, the process of actually getting back in to, and remaining, in the workplace can be tough. Many people – including your employer, workmates and family – may not realise how stressful it is to return to work after cancer treatment. Cancer may have changed your view of the world and what you want from your life; it may also have changed your energy levels, ability or motivation to concentrate and your ability to do physical work. To help you get back to work, if that’s what you want to do, this employee toolkit – which includes information on communication, return to work options, and striking a healthy work/life balance – looks at ways to begin the process. Going back to work for anyone after a period of absence can be a challenge. Here we look at how communication is the first step. From working less hours, to starting later in the day – there are plenty of ways to help make your transition back to work easier. Once you’re back at work, it’s important to keep a healthy balance between your work and home life. Here are a few tips.